Our advanced training programs are designed for professional organizers who are ready to specialize. Add a new income stream, receive credentials in specific approaches and benefit from in-depth training with other experts. Some of the offerings include FreedomFiler, Train the Speaker and Mastery Coaching with the Marla Dee. This is an in-depth training of FreedomFiler, the world’s best, all-encompassing, self-purging filing system for home or small business. 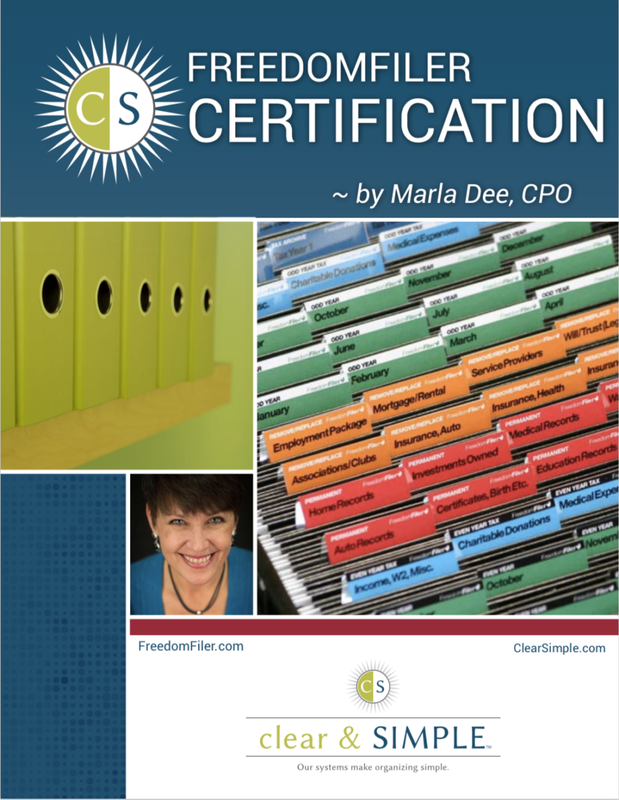 By choosing Clear & SIMPLE for your training you will also receive a BONUS GIFT of Get Organized, the Clear & SIMPLE Way audiobook, by Marla Dee. This Virtual Training is given in three modules together with self-study work. Following your sessions, you will complete a written self-exam and verbal exam with Seth Odam. Upon completion of these exercises you will be certified. FreedomFiler offers a tremendous support system for you and your clients. Thank you for allowing me to share this fantastic system with you! You have paid your dues and made it to the mastery level. Now is time to become the expert in your chosen area. It is time to add another level of income.